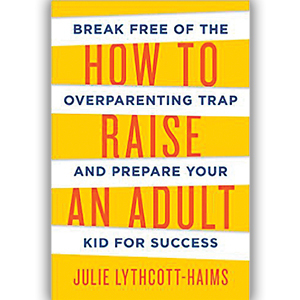 “Why did parenting change from preparing our kids for life to protecting them from life?” Julie Lythcott-Haims asks in her book, How to Raise an Adult: Break Free from the Overparenting Trap and Prepare Your Kid for Success. While this title references many of the titles reviewed by Parenting by the Book – Free-Range Kids, The Price of Privilege, and The Battle Hymn of the Tiger Mother – it does a great job of bringing all of the resources together for a persuasive argument against helicopter parenting. For all parents scheduling to ensure that kids have every opportunity, Lythcott-Haims maintains, they are actually limiting their children’s future opportunities for success. Students lack the commitment, persistence, and problem solving capabilities they need to thrive due to a lack of free-play in which they are the masters of their own destiny. The fact that Lythcott-Haims reports the findings of a 2014 study from the researchers at the University of Colorado-Boulder, which was “the first to correlate a highly structured childhood with less executive function capabilities,” only serves to illustrate this point. That is what this book does. It tackles everything from what we’re doing now to why we must stop overparenting to how to parent differently based on effective research and moving anecdotes. Essentially, Lythcott-Haims argues the heart of the problem is “the student’s inability to differentiate the self with the parent.” Without the space to learn how to survive on their own, students lack confidence in their abilities and are unable to deal with failure. and allow their parenting behavior to be motivated by their own ego. And there’s no denying that overparenting stresses us out, too. According to Lythcott-Haims, “American parents are depressed at twice the rate of the general population.” Essentially, our failure to normalize struggle causes greater stress on our children and ourselves. Twenty-six minutes! This statistic really moved me because sometimes I find myself feeling bad for requiring my children clean up after themselves at the end of a long day. But when I think of it in those terms, it’s really nothing in the grand scheme of things. In fact, how will I ever instill a work ethic in my kids if that’s all the practice they’re getting on a daily basis? Granted, they are at school and on homework, but, as Lythcott-Haims explains, “a work ethic is about taking care of more than number one” and this is something few middle-income children have practice in these days. So if you’re worried that your good intentions may have gone awry, I recommend How to Raise an Adult by Julie Lythcott-Haims. It offers practical strategies to parents, who struggle with letting their children learn from their mistakes.